The present reference is a special application of current source IC Type LM334. It has a tiny temperature coefficient and draws only a minute current: at room temperature, only 10 µA, which increases with large rises in temperature by only a few µA. The circuit is basically a bandgap reference, because the positive temperature coefficient of the LM334 is combined with the negative temperature coefficient of the base-emitter junction of a transistor (which ensures good thermal coupling). To obtain a temperature coefficient of zero, or very nearly so, the output voltage of the circuit is adjusted to exactly 1.253 V with P1. It is, therefore, advisable to measure the set value of P1 accurately after it has been adjusted and to replace the combination of R1+P1 by a fixed resistor of the precise value. Use a 1% metal-oxide film type from the E96 series. Since current source IC1 is tapped at the control input, a reference source with a negative output resistance of about 3.8 kΩ ensues. Resistor R3 ensures that the ultimate output resistance is about 400 Ω. 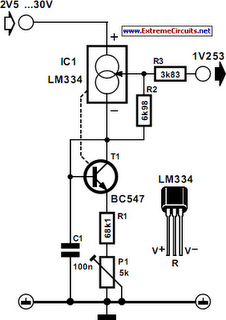 The load current is then limited to not more than 5 µA. The performance of the reference is good: when the input voltage is increased from 5 V to 30 V, the output voltage varies by only 0.6 µV (from 1,2530 V to 1.2536 V). The temperature coefficient stays below 50 ppm °C–1, and, with careful adjustment, may even come down to 5 ppm °C–1. The current drawn by the prototype is 9.8 µA at an ambient temperature of 22 °C.